Tom McClintock, once the shrewdest guy in the Legislature, is now among the shrewder people in Congress. Last night the Northern California lawmaker sent out a column trashing the two-year budget compromise approved by the House at the behest of House Budget Committee Chairman Paul Ryan, R-Wis. Here it is in its entirety. The great irony of the Republican decision to bust the budget sequester is that barely two months ago, congressional roles were reversed. The Democrats insisted on funding the government according to existing law. The Republicans sought one simple change: that the individual insurance mandate under Obamacare be delayed for one year. They were trying to spare the American people the Obamacare disaster that is now unfolding, but to no avail. The American people sided overwhelmingly with the Democrats on the principle that the government should be funded according to current law without any side issues. Why wasn’t that principle applied just two months later? Republicans were in the ideal position to hold the budget line simply by insisting on enforcing current law. Instead, the House Republican leadership pushed through a two-year budget that will allow the federal government to spend an additional $63 billion more than current law allows – money that our country does not have. Some of the discussion has focused on how much of the spending spree will be paid with higher taxes. The answer is, “all of it.” Once government spends a dollar, it has already decided to tax that dollar – the only questions that remain are who gets the bill and when. Sixty-three billion dollars of new spending – and therefore new taxes in some form – is not a small amount of money. It averages about $570 of added burdens for every family in America. The lie is given to this promise within the measure itself. A major part of the alleged long-term deficit reduction is the assurance that after a two year spending binge, Congress will not only enforce the sequester but will even extend it for an extra two years in 2022 and 2023. Pardon my skepticism. We are required to believe that in the future, Congress will magically summon the fiscal discipline that has eluded it in the present. A side deal called the “Doc Fix” offers more reason for doubt. The “Doc Fix” has become an annual ritual arising from a previous budget deal that promised long term savings, except that Congress votes every year to ignore it (oops there goes another $8.7 billion). True, discretionary spending will be less than the House budgets of 2011 and 2012, but this is a sleight-of-hand. 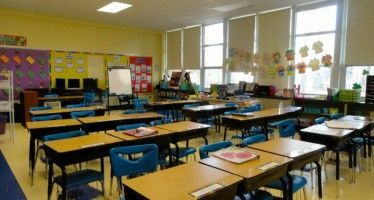 Those budgets were unified packages of reforms that saved most on the mandatory side of the ledger and must be viewed in their totality -– not picking and choosing which parts to compare and which to ignore. Finally, we are told that there are not enough votes in the House to support current-law spending. There’s one way to find out: put a clean measure on the floor and see where the votes are. That’s essentially how the impasse was resolved two months ago. The sequester provided less than a third of the deficit reduction that Standard and Poors warned would have been necessary to maintain our triple-A credit rating, which is why many conservatives opposed it. But it was at least a step in the right direction. It was an agreement that Congress made with itself, and given the political realities of a divided government, it became the only viable instrument to keep spending under some modicum of control. The busting of that limit now calls into question any promises of future fiscal restraint. The new Congressional budget is a mistake at a time when we can’t afford many more mistakes. The path of least resistance, even if paved with good intentions, is not a path America can afford to travel any longer. 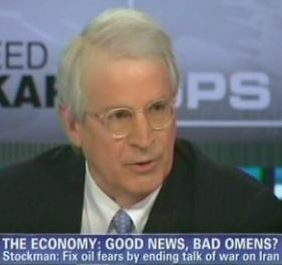 McClintock is a better writer than a heck of a lot of journalists. How do I know he wrote this himself? I hosted a talk-radio show for two years. He was one of the very few people I ever interviewed (Victor Davis Hanson was another) whose responses were always like cogent mini-essays. Thesis. Supporting evidence. Factual poke at opponent’s counterargument. Restate thesis. He writes like he talks. 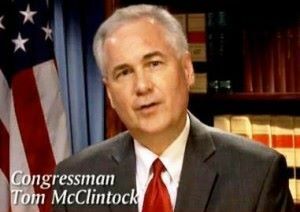 If McClintock keeps speaking the truth like this he’d better watch out – his colleagues are going to put him in the congressional doghouse or start some sort of bogus investigation on him so he’ll have to spend all his working hours mounting a defense. That’s the way they do an end run around protected speech and the truth. lol. Here are some more facts that substantiate my claim that the dems and the republicans are all on the same team but only wear different colored jerseys to fool you into believing we have an adversarial political system. In the State of Calfornia do you know how many FISCALLY CONSERVATIVE Republicans voted against this bogus budget that throws the younger generations under the bus??? TWO: Tom McClintock and Dana Rohrabacher. That’s it!!! In fact, there were MORE Calfornia dems who voted against the bill than republicans. A total of SEVEN!!! lol. Looking at Congress in it’s entirety – the vote was 332-94. A full SEVENTY-THREE PERCENT of the FISCALLY CONSERVATIVE republicans in the House voted in favor. Not too far below the 84% of the democrats in the House that voted “aye”. Tom McClintock did a good job at pulling back the curtain and explaining the the fraud in the budget bill THAT THE MAINSTREAM MEDIA HAS COMPLETELY IGNORED!!! lol. The purpose of the media is to ensure the American people are FULLY INFORMED and there there is FULL DISCLOSURE with regard to government actions (or inactions) that impact our lives. The media is supposed to be the gatekeeper that protects us from tyranny! Look at all the lies Obama told us about ObamaCare and the media NEVER called him out on it until it couldn’t get hidden any longer. Obama repeated the “If you like your health plan you can keep it. No matter what. Period” literally DOZENS of times and throughout his 2012 campaign. Where were all our elite mainstream investigative reporters making nice big six-figure salaries? Asleep at the wheel? I expect politicians to lie to us since there is no real punishment for doing so and since the moral code in American politics is practically non-existent. Maybe I’m old fashioned but as an American citizens I still certainly expect the press to fulfill their duty by protecting us and our nation from these manipulators and frauds who continue to do great damage to our country via deceit and non-disclosure of vital information when enacting laws. The $23B in deficit reduction in this new budget is nothing more than a hoax. Why? Because it won’t happen in the 2-year time frame of this deal. The cuts happen in FUTURE YEARS over a 10-year time frame. It’s all for show to fool the people. They have to fool you to restore the $63B in sequestration cuts. Look back over 30 years of Federal legislation. The cuts always get repealed and wiped from the books when the next Congress gets seated and negotiates the next budget. But the taxes remain set in stone. lol. This is the deceit that the media repeatedly FAILS to report to our citizens. This is the bottom line: They’ve painted our country into a financial corner. Deficit spending and QE is no longer an option. It’s mandated to keep the GDP in positive numbers. That is the ONLY reason your home prices are increasing and the DOW is at 16,000. Debt financing. Without it, the economy gets flushed. This is the problem: You can only hand only so many bottles of scotch to the falling down drunk with stage IV cirrhosis of the liver to cure his alcoholism until he flatlines. And it’s the young people (who did not cause the problem) who are going to get hurt the worst. That’s what makes all this so disgusting. LOL— Sad to se the ultra right baggers out eating their young again.